The new major release 2.1 build 000 of DynDevice (training management system), the system equipped with e-Learning platform, SCORM™ editor (LCMS with authoring tools), HR management, web content management e company intranet management is now being released on the whole Mega Italia Media Cloud network. The following release note lists and explains all the improvements brought upon by the new update, divided by solution. New graphic style and usability. • The "Toolbar ribbon" menu has been re-sized in height in order to expand the work area. Site navigability has also been substantially improved thanks to the introduction of high-contrast elements and single-colour icons. As shown here, switching between solutions can now be performed using the hexagons on the right side of the menu. • The windows now expand more horizontally then vertically: tabs and "standard" buttons (such as [New], [Edit], [Delete], [Create], [Save], etc.) have been moved from the bottom-bar of each window to a new column on the left of every page, which leaves a larger space for the main content. Therefore the bottom-bar, when not required, is no longer displayed (thus enabling optimal use with widescreen monitors, which are progressively becoming the de facto standard). • windows of the "List" type have also been adapted to the new layout, allowing for easier browsing of lists and more efficient scrolling between pages. Multiple file upload. Another important enhancement is the conversion of the "File uploader" included in the "File manager": this component was previously developed with Adobe Flash™ (which is becoming less and less popular on browsers) but it has now been replaced with a HTML5 component, thus ensuring all-browser compatibility. The "Advanced tests" that can be built with your SCORM™ editor for solution 3. Course creation of DynDevice can now be integrated with psychodiagnostic questionnaires from the Giunti O.S. platform. When the integration is activated, you can add the id of a Giunti O.S. questionnaire to be completed by users during an advanced test. Once a user has completed the questionnaire, DynDevice will automatically download the relative report of results in PDF from the Giunti O.S. platform. The management of alerts on course use to be sent to learners has been completely redesigned, as it is now possible to use the visual editor for content as well as set different texts for each of your platform's active languages and create a text-only version of alerts (for old email services which do not support text formatting). New "Language" field for learners. 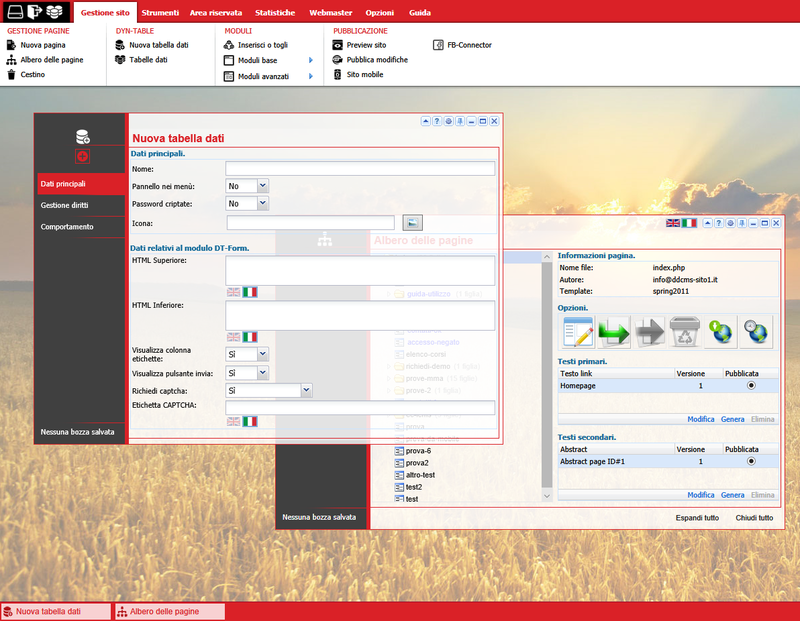 A new "Language" field has been added to learners' personal data: consequently all related control panel windows, the collection of enrolment forms on e-Commerce modules, all relevant API processes, the creation of users via CSV and the report generator have been modified accordingly. Creation of reports. The "Completion/Progress %" column in Excel reports now contains a link to a PDF of the certificate if a user has succesfully completed a course. "Payroll" module. The flash uploader file has been replaced with a HTML5 component on this module, too.